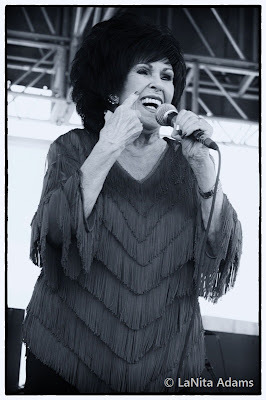 Wanda Jackson took the stage at the Newport Folk Festival this past Sunday. She delighted the crowd with songs from her recent record along with classics and her familiar rock 'n' roll growl. Jackson, rocked, rolled, charmed and shimmied for an adoring crowd telling stories of Elvis and made me a happy camper when she launched into "Fujiyama Mama," the song that introduced me to her work many years ago when I was but a wee lass. The above photo... Jackson telling the person tossing around the beach ball to knock it off by saying whenever there's something being tossed around in the audience, it eventually finds her face. She said she's had black eyes and lost a tooth and while a beach ball wouldn't do all of that, it's distracting and would appreciate them not playing with it during her set. It was possibly the most polite reprimand I've ever heard from a musician onstage. While there were a lot of younger acts performing over the weekend who were great and lots of fun, it's always a pleasure to have the opportunity to see a veteran performer rocking out and having a good time. Rock on Miss Wanda!